Paella (pie-ay-yuh): a Spanish dish containing rice, saffron, and a mixture of chicken, seafood, and sausage, among other local ingredients and spices. 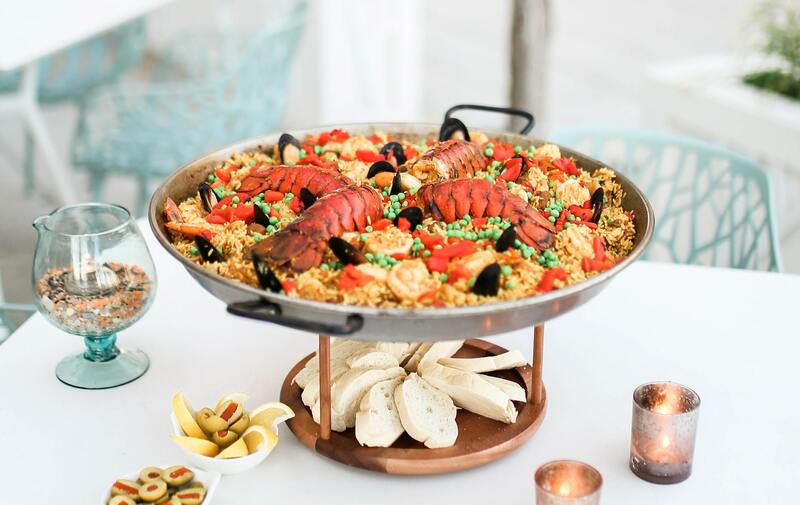 Paella originated in the eighteenth century along Spain’s eastern coast near the city of Valencia and quickly permeated Spanish and Western European culture, becoming a regional staple using variations of fresh, local ingredients. Although paella is known as a Spanish dish, it has become immensely popular in the American South. The soul of the South is often found in recipes passed down through many generations, from Hoppin’ John in the Carolinas and tamales in the Mississippi Delta to fried chicken in Alabama and jambalaya in Louisiana. Culinary culture in the South is truly a melting pot of ingredients, recipes, and spices. It should come as no surprise, then, that paella has become so popular among Southerners and chefs in the region. While not to be confused with jambalaya (although paella was an early influence on the Creole recipe), the Spanish dish and its variations of ingredients, methods, and spices perfectly mirror the American South’s cultural, culinary melting pot. Deep in the American South along Scenic Route 30-A in the Florida Panhandle, paella has developed somewhat of a cult following. 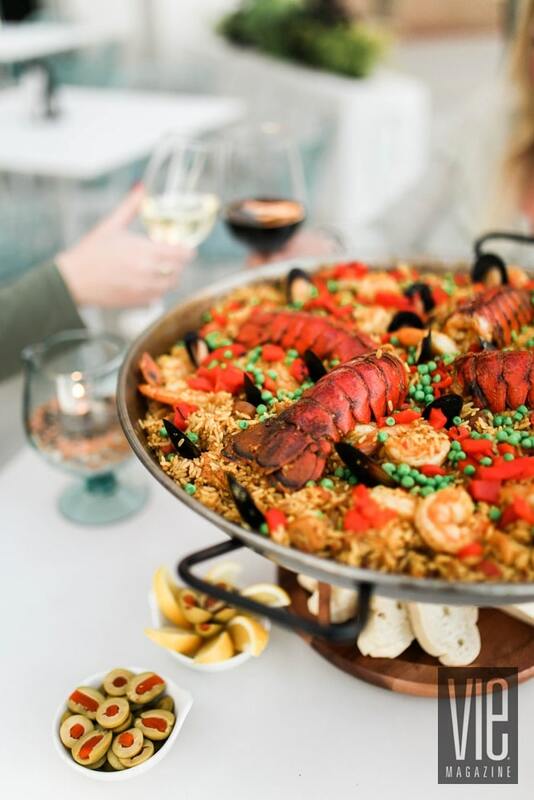 On any given Wednesday, Friday, or Sunday night in the quaint little community of Seaside, Florida, you will find the Paella Queen manning her station inside of 45 Central Wine and Sushi Bar. A twenty-one-year fixture on the Seaside culinary scene, Joyce Russell was a founding partner of Fermentations wine bar in 1997 and even became known to Jim Carrey as “the food lady” when the restaurant catered for the cast and crew of The Truman Show during its filming. But it wasn’t until several years later that Russell tempted fate and challenged Maria Pilar Rubinos Baxter, a native of Madrid, Spain, and a family friend, to a paella cooking contest. Russell, in her infinite wisdom and with an “I can do anything” attitude, purchased the freshest ingredients for the dish: local grouper, lobster, mussels, clams, shrimp, and chicken. Baxter only bought five ingredients. Russell thought that by using the most ingredients she would win; her opponent, however, had secret weapons: her seasoned paella pan and secret seasonings. Baxter explained to Russell that in Spain, locals use proteins that are available and keep the recipe simple but full of flavor, always using a variety of spices, including, of course, saffron. In the end, Baxter’s recipe won, and Russell’s ego was a little bruised. She was humbled by the experience but determined to learn. Five years later, Russell found herself in the catering business, and she was hired to cook paella for a large wedding event. Studying under Baxter, Russell had perfected her own recipe. She faced a new challenge, though: how to cook paella for a hundred people at a party versus eight people in her tiny kitchen. She purchased the largest pan that was available at the time and a burner—a six-hundred-dollar investment just for the equipment. That was the spark that ignited the fire of paella along Scenic Highway 30-A. And the Paella Queen was born. 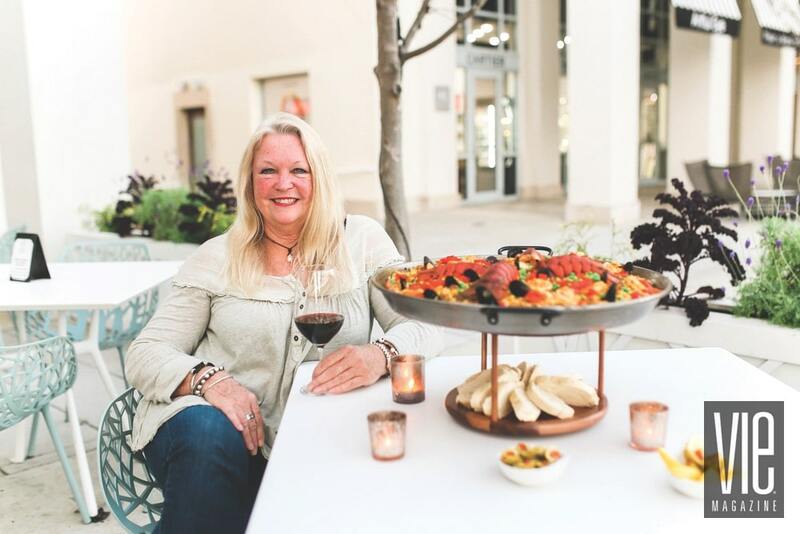 As fate would have it, Chef Jim Shirley was hiring for his catering company at that time, and by the time he opened 45 Central wine bar in Seaside in 2014, Russell was known as a tried-and-true paella chef, at least among her peers. Russell, along with Jim Shirley and their team, decided to try cooking and serving paella one night a week for the guests at 45 Central. No one could ever have dreamed what a tremendous hit it would become—so much so that a second and third night had to be added to accommodate the growing following. Paella nights at 45 Central quickly became tradition, and the queen found herself woven once more into the fabric of Seaside and the 30-A community. As the crowds grew, so did the pans. A second, larger pan was purchased to accommodate the Friday and Sunday night crowds. Affectionately called Pan-Tiki, it is dwarfed by the company’s newest addition, PanZilla, which is eight feet in diameter and used for large-scale special events. Most recently, the pans were deployed in the wake of Hurricane Michael to provide hot meals for relief workers and victims of the storm in Panama City and Port Saint Joe. 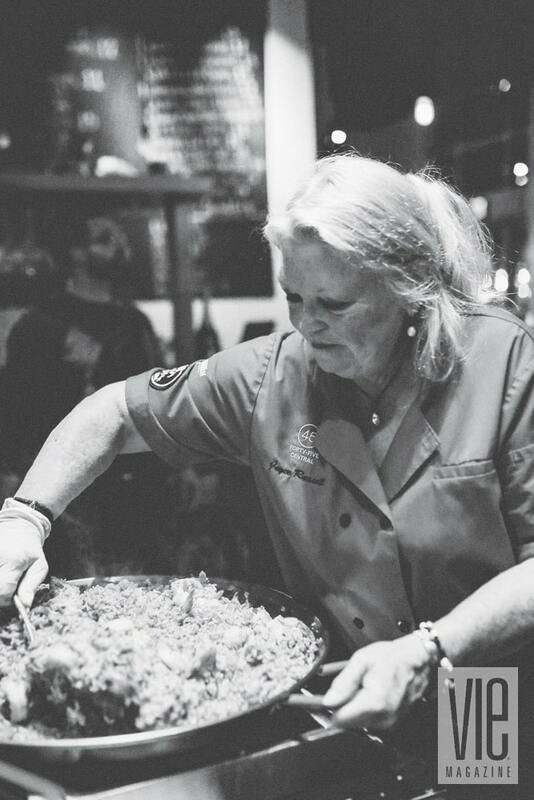 For the Paella Queen, her work is about more than just the food—it is about the experience. Russell most enjoys the people and the sense of community. While she may grow tired of hearing “Is that jambalaya? 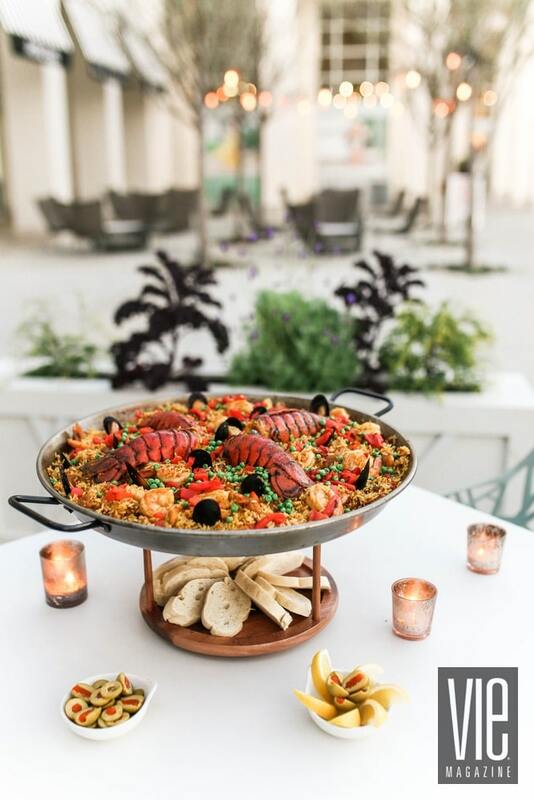 !” she never tires of the camaraderie between locals, new customers, and repeat visitors who plan their vacations and family trips to the beach around paella night at 45 Central. 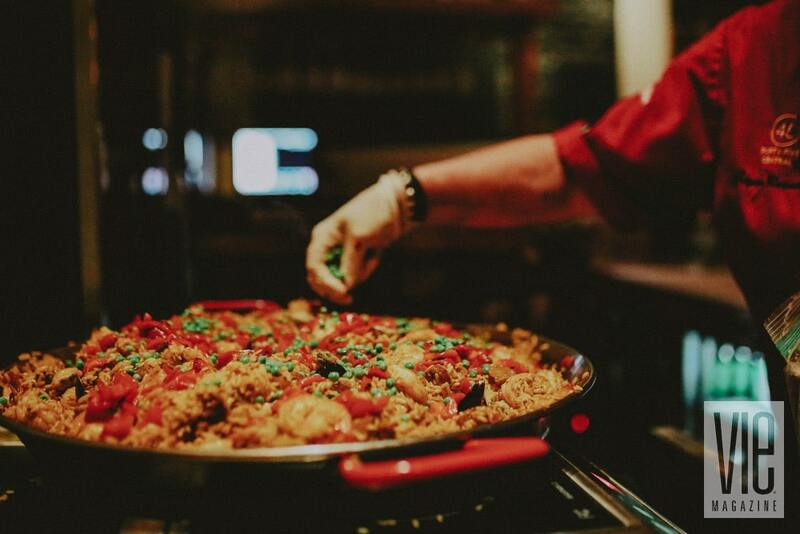 The 30-A paella experience brings a European flair to Florida’s Gulf Coast and provides locals and visitors with a change of pace and culture a few nights each week. As for her recipe, Russell uses the basics—rice, saffron, shrimp, mussels, chorizo, and sausage—but keeps a tight lip when it comes to her secret seasonings. Russell has embraced her reign as the queen, sitting upon her throne (or standing behind her pan) and making sure that each dish is made with nothing but the best ingredients and a lot of love. Long live the Paella Queen! 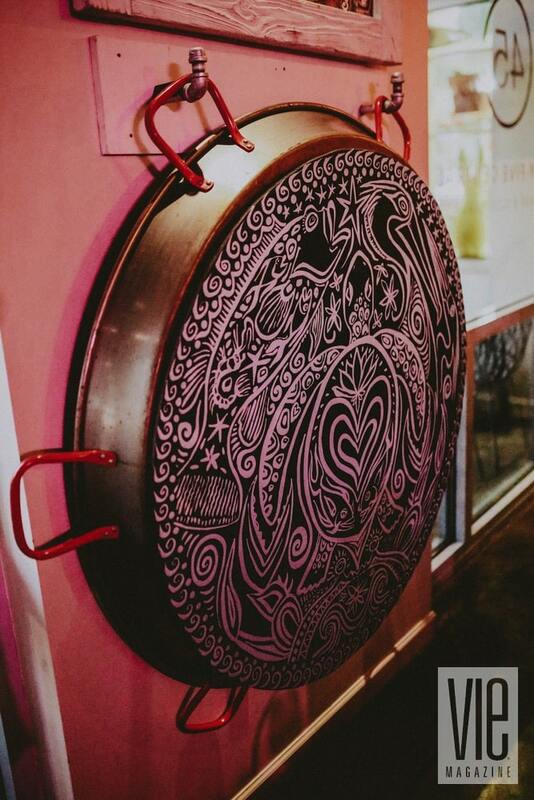 Visit FortyFiveCentral.com to learn more or plan a visit for paella night—every Wednesday, Friday, and Sunday at 6:00 p.m.